It’s high season! Our farmers will be bringing corn, tomatoes, green beans, peppers, peaches, greens, beets, eggplant, zucchini and much more to the market this week. The Can Man has a wide variety of jams and salsa. Sample his pineapple habenero salsa and other fine flavors. 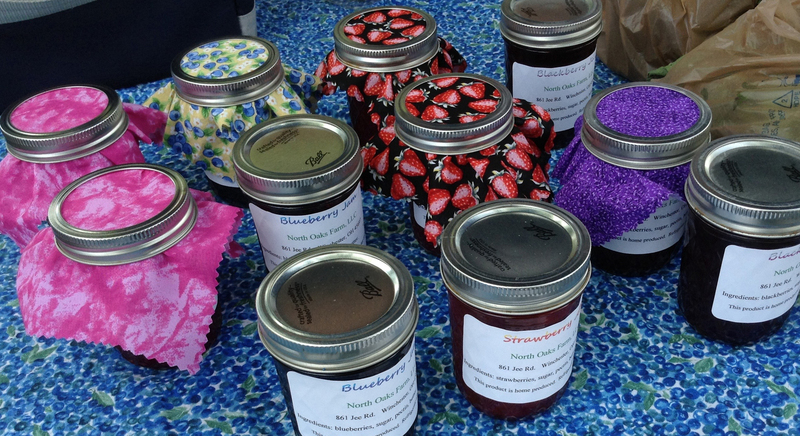 North Oaks Farms brings homemade jams made with fruit raised on their farm. Grandola Granola offers a tasty summer granola flavor. Aunt Flora’s cobblers are always a treat. The Kid’s Corner this week features story time by Princess Janice from 3:30 to 4:30. All children participating will enjoy a snack, a craft and a parade around the market! Music at 3:00 from the College Hill music camp students of Marion Peraza de Webb. The market runs from 3:00 to 6:30 on Thursdays. This week, come to the market and stay for the College Hill Block Party, which continues till 9 pm. Live music, free food, games, sports, face painting and more, all at the corner of Hamilton and Llanfair in the parking lot of the College Hill Presbyterian Church. This entry was posted in News and tagged Aunt Flora, Back Acres Farm, College Hill, College Hill Farm Market, College Hill Presbyterian Church, CSA, farmers' market, Llanfair Retirement Community, local farm, local food, North Oaks Farm, Produce Perks, Twin Towers by College Hill Farm Market. Bookmark the permalink.